The Q5 is nicely packaged and ready for the match. The author wishes those magazine cutouts had been filled by 17-round mags. Three 15-rounders are included. The Q5 Match is not brand new to the market. It has been available for nearly two years. But until I received the test gun from Walther, I had never seen one in person. And so, I begin my evaluation of this handgun with a conflicting mixture of enthusiastic expectations, and a sense of ‘how much better can it be?’. Let’s find out. It’s easy to presume that everyone has shot a Walther PPQ M2, but even amongst the most serious of competitive handgun shooters, I constantly encounter people who have not, and are curious what I’m shooting and how I like it. The PPQ is based primarily on the Walther P99. It is a significant evolutionary step in the Walther handgun design. 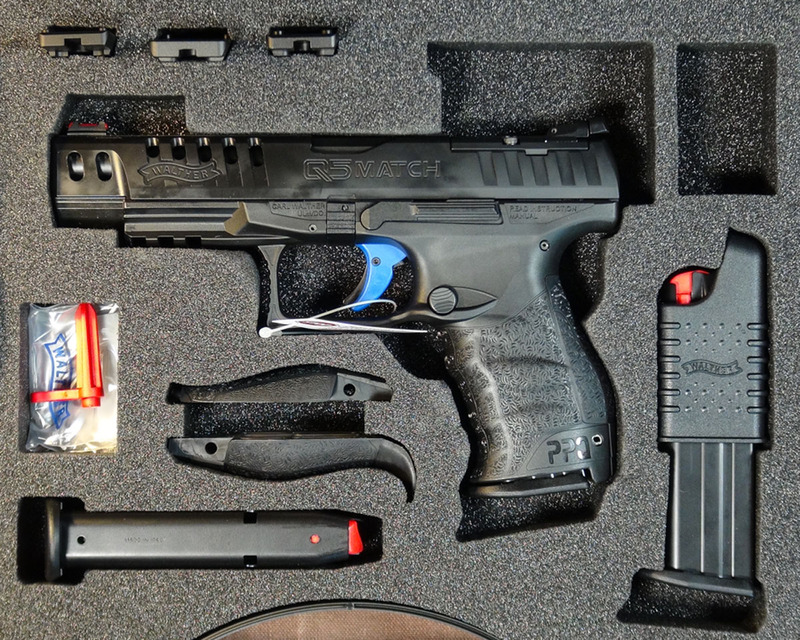 So, let’s begin by exploring just what the Walther PPQ M2 is all about. For me, it begins with a handgun that was designed to near perfection from the start. There are certain controls required on the outside of a handgun in order for the operator to effectively use it. 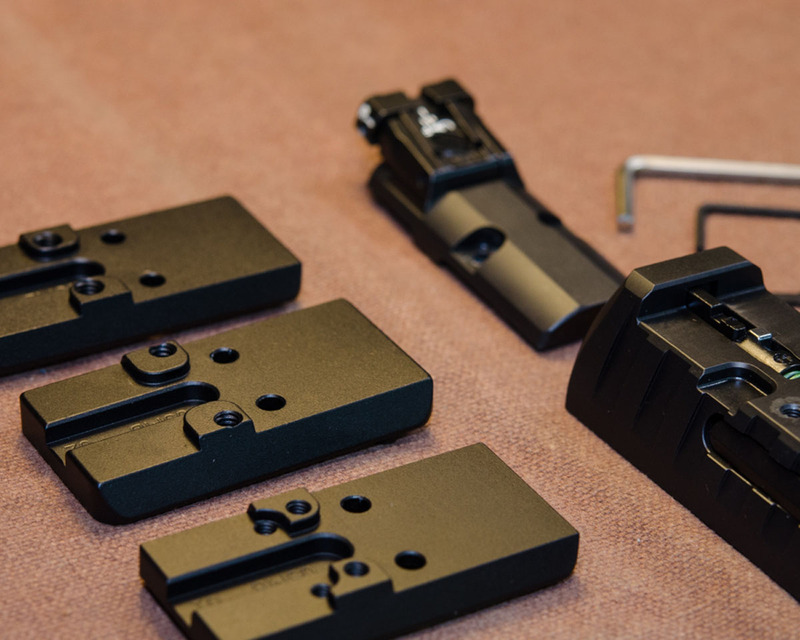 And while some gun makers still seem content to bolt-on or weld-on massive levers or buttons in almost the right places – the engineers at Walther took a completely different and ergonomic approach. “Ergonomic” is a word that gets over-used and is almost as misused as “ambidextrous” sometimes. There can be found varying definitions for the word ergonomic, but I think “relating to or designed for efficiency and comfort of use in the intended environment,” sums it up nicely. Many gun makers achieve one or the other, but not so many checks both boxes – in fact, I can’t think offhand of any other that does it as well as Walther. The shape of the grip frame is such that it melts into the palm of your hand. The texture provides good adhesion to the skin without being abrasive. The finger grooves are subtle. ‘Comfort’… check. ‘Efficiency’ however might be a tougher nut to crack. Especially since almost everyone has a different definition and expectation. I think of efficiency as the ability to maximize my potential use of the handgun with as little cognitive consideration for the tool itself as possible. Put more simply – if I have to think about what I’m doing with the gun, it’s lacking in efficient design (proper training and experience notwithstanding). If I have to make any considerable shift to my grip to operate controls such as the magazine release or slide release, that is a big negative. The central point of the Q5 ergonomics is the fantastic trigger. Operating controls must function and they must function easily and consistently. The magazine release button (the ‘button’ is what makes the pistol an M2 – the original PPQ had European style paddle releases on the trigger guard) can be easily operated without a grip change even for people like me with smallish hands. It’s large and easy to push in with just the side of your thumb. The slide release levers (one on each side of the upper frame) are swept back far enough to be easily reached by that same strong hand thumb. And because the levers are quite long, they do in fact achieve a great deal of leverage and drop the slide with just a swipe. But never fear – if you are one of those who prefer to run that slide home with your support hand, the serrations in the slide are generous and effective. Especially on the front end of the Q5, which is basically like grabbing a cheese grater that somehow doesn’t cut you. And I haven’t even started talking about the trigger yet! The stock trigger of the PPQ is nothing less than legendary in the handgun world. WHAT DOES THE Q5 MATCH ADD? 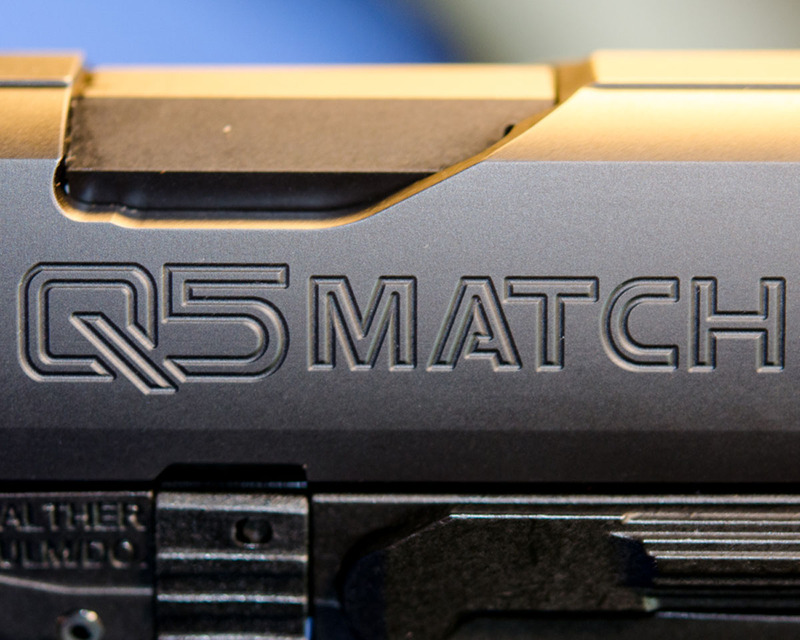 So, after all the hoopla I just gave you about the PPQ, you may be wondering just what the Q5 Match brings that adds features, performance, or value to that. That was my question for a long time before I was able to test one for myself. Here’s what I found. 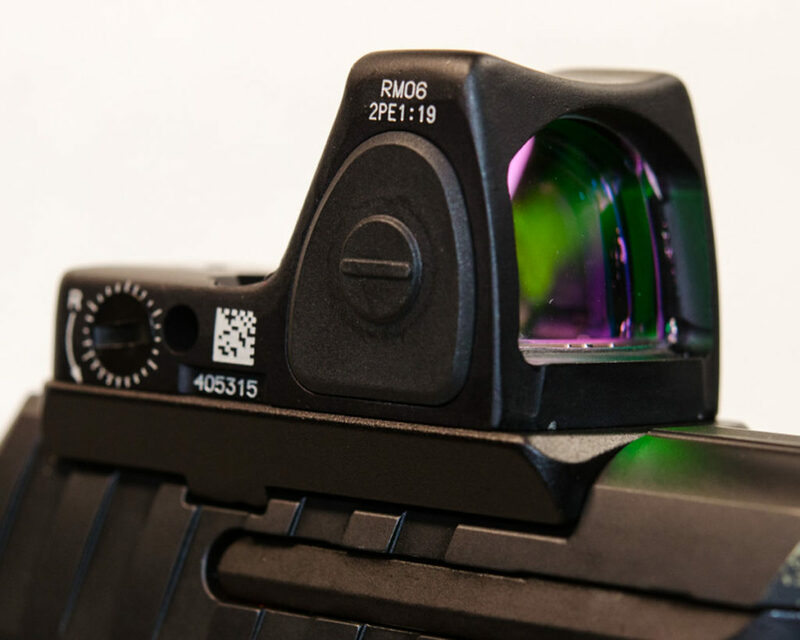 Optic Ready – The obvious added feature of the Q5 is that the slide is pre-milled and ready to accept a red-dot or RMR optic. This newest trend in handgun use has led nearly every manufacturer to offer at least one model that is ‘optic-ready’ out of the box. However, there are not very many that began their life on the drawing board as carry optics handgun and in virtually all cases this is a factory retrofit. 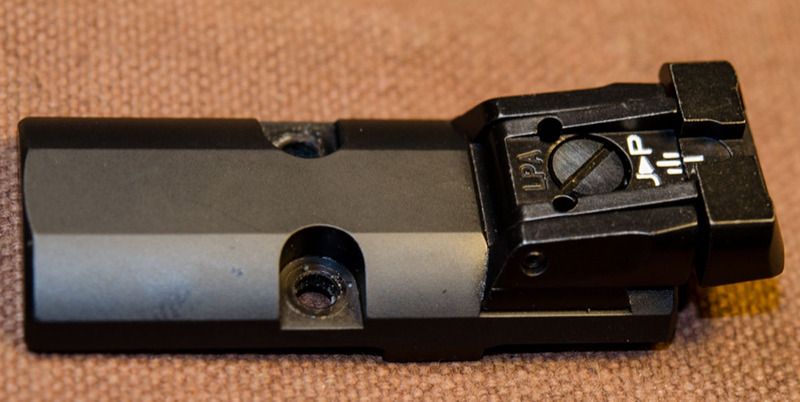 In the case of the PPQ Q5 Match, in order to take off enough material to properly sink the mounting plates, the striker channel was actually exposed. Sort of like, “we were able to dig that pool you wanted in the backyard, but there’ll be a sewer pipe in the bottom of it”. Structurally, I doubt that there has been any compromise at all, and visually it’s kind of cool looking, but I can see an opportunity for dirt, lubes, solvents, and other foreign matter to find its way into the striker channel. For Heaven’s sake – be careful where you put the Loctite! An extra measure of care when the channel is exposed should mitigate any risk there. Walther provides three RMR adapter plates that fit most popular electronic optics. Like everyone else, Walther provides several mounting plate adapters that accommodate the industries most popular brands and mounting styles. Luckily, many brands use the same mounting configuration (i.e. Holosun and Trijicon mount on the same plate) but it is still wise to research what will fit and what won’t before you make a costly investment in that new optic. It’s likely too late now – but an industry standard mounting configuration would have been nice! Once mounted, the optic sits respectably low on the slide. Further indication that the PPQ slide was never designed with this use in mind, the mount juts out on both sides due to the upward taper of the slide. Yet somehow that works and it is not distracting to the design of the pistol. Walther chose to mount the rear sight onto the removable cover for the cutout, so there is no opportunity for co-witnessed sights and RMR. I say ‘chose’, but in reality, there was likely no choice. The exposed striker channel is interesting to view, but take care not to get anything in there! The shape of the PPQ slide was not originally intended to host an optic, but Walther has done a good job of retrofitting the design. Enhanced Slide Lightening – Another feature of the Q5 Match that is quite obvious from across the room is the very aggressive (and in this writer’s opinion very attractive) slide cuts. Significant weight has been removed from the slide, even compared to the 5” PPQ. The practical reason for this is to take weight out of the slide, out front where it serves as little more than a dust cover for the barrel. Making the slide lighter means less energy is required to cycle the action – and that is conducive to lower pressure competition ammo – most commonly hand loads. Additionally, less weight is less reciprocating mass and less recoil. It also is key to ensuring that the added weight of an optic and adapter place don’t have the opposite effect and cause cycling malfunctions. Without an optic, you could likely shoot powder-puff loads reliably. With the optic, your “barely makes power factor” ammo should still run… mine does! Lightening the slide was done for practical reasons, but it was done in artistic form. Better Sights – And I don’t mean just a little bit better. One thing I never liked much on the PPQ was the stock sights. You can’t upgrade them fast enough. 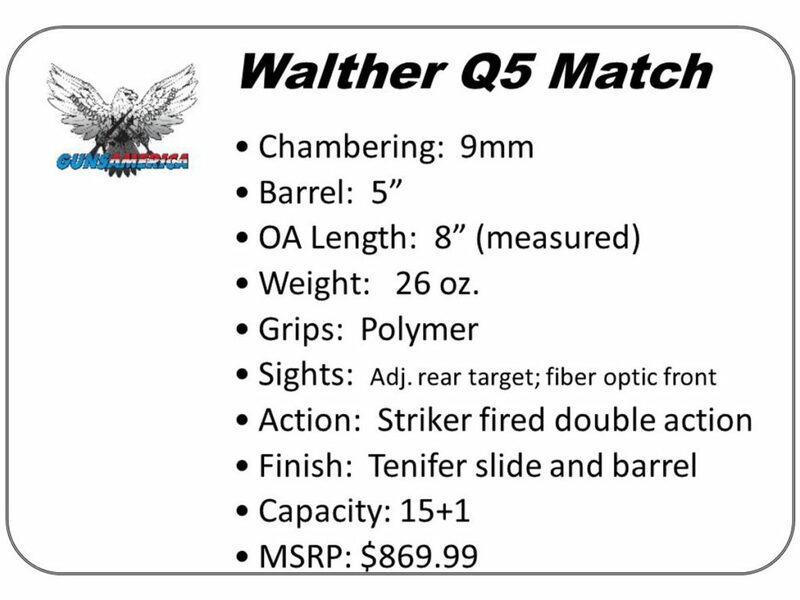 For the Q5 Match, Walther has replaced the very pedestrian three-dot setup with a far more appropriate blackout rear that is fully adjustable and a front fiber optic sight pair. This is the sight picture a competitor expects and the bright fiber is quick to acquire in the notch of the all black rear blade. When you don’t need an electronic optic installed on your gun, this is a very nice sight picture to work with. 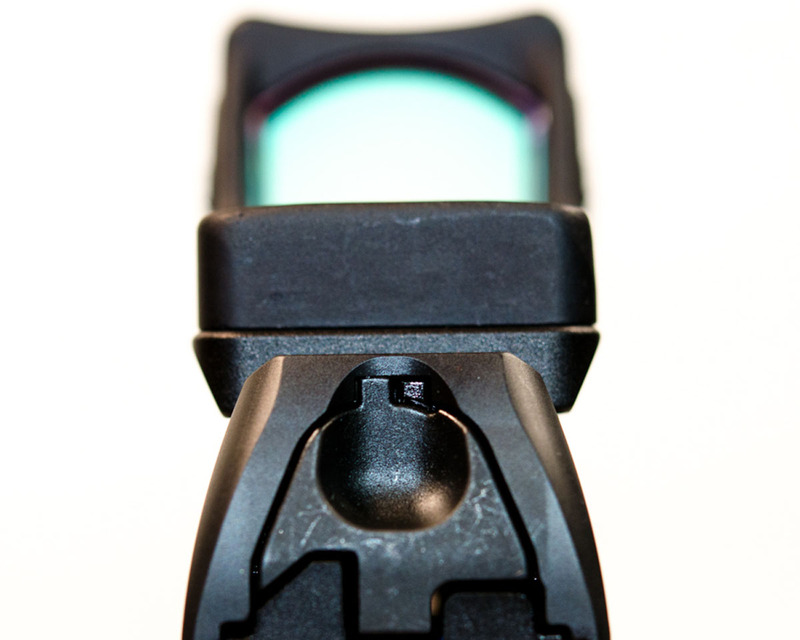 The black rear sight is fully adjustable on the Q5 Match. Because I have been shooting the PPQ 5” for several years, most of that in IDPA matches, there was zero time needed for me to get acquainted with the Q5, save for the mounting and use of optics. There is an important note to make regarding that, however. If you have a PPQ and are ready to upgrade to the Q5, bear in mind that your holster may not accommodate the mounted optic. Mine didn’t. A quick call to my go-to holster company, Multi Holsters solved that problem within a week and I was able to run and gun like I wanted to. My thanks to Tony and the team for coming through in a pinch! 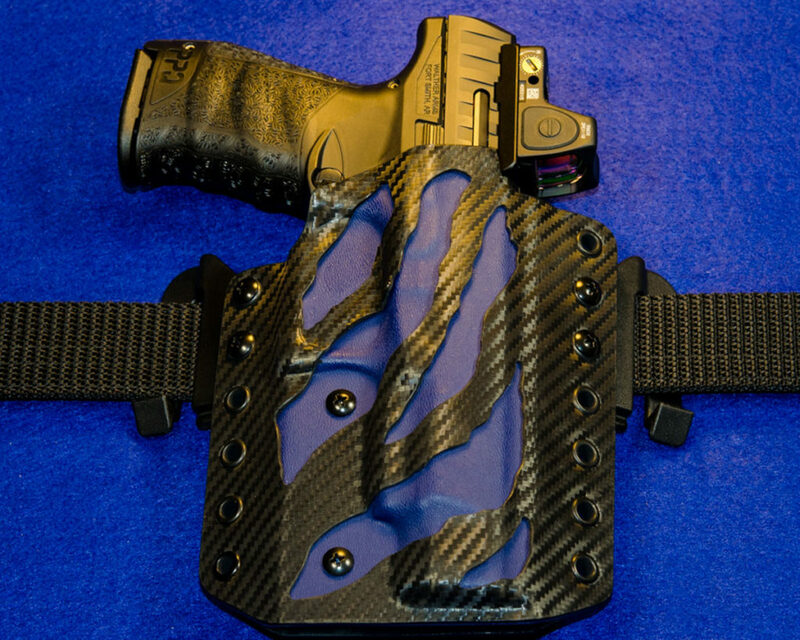 Top quality guns need top quality holsters – like this Kydex rig from Multi Holsters. 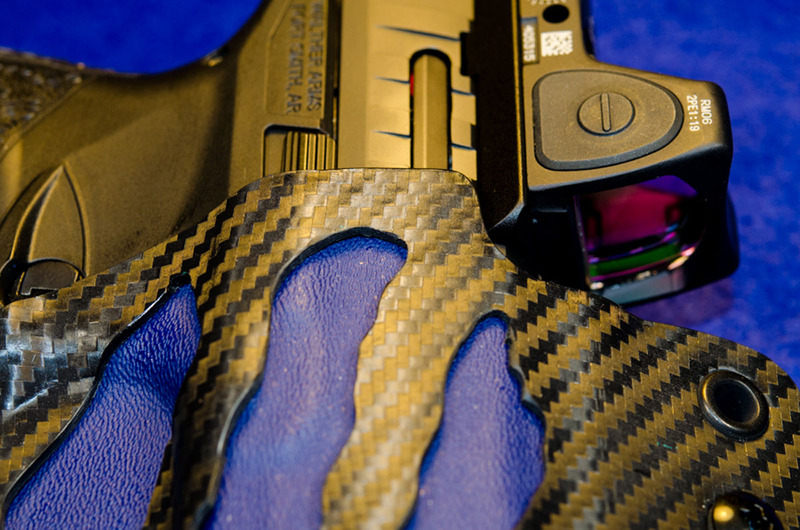 The Q5 boasts the same legendary PPQ trigger that many of us have come to love. 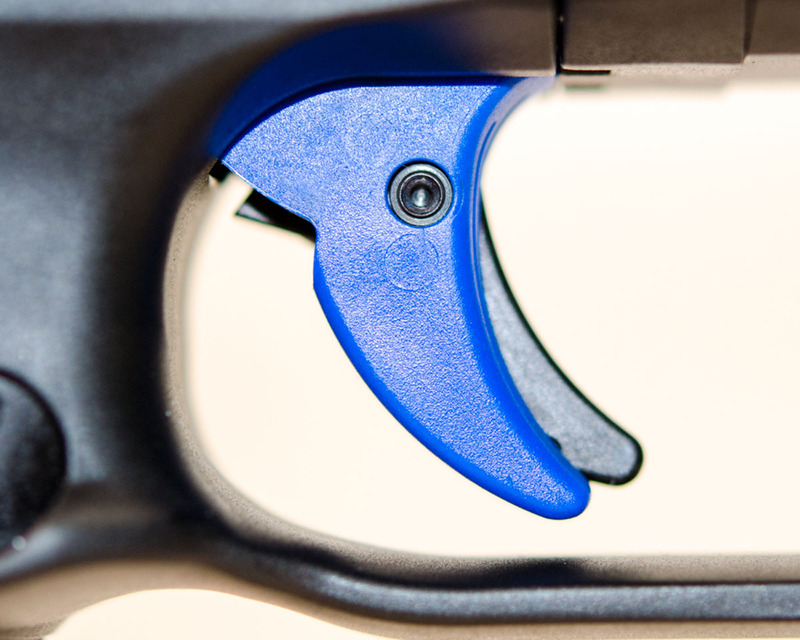 Although there are no mechanical differences, Walther gave the Q5 trigger a paint job and made it ‘Walther blue’. This coloring extends to the trigger bar as well. Light and crisp is the trademark of the trigger, but the true magic for me is the short reset and excellent tactile feedback. This is what allows me to ride the reset for rapid fire without worrying about either slapping at the trigger or short stroking it and blowing my rhythm. Accuracy is every bit as good with the Q5. It’s likely better, with the upgrade to the Q5 Match Grade barrel – but you’d need a far more skilled shooter than me to see the difference! Being able to operate the pistol’s controls without changing my grip, along with the ease of use of those controls is huge. 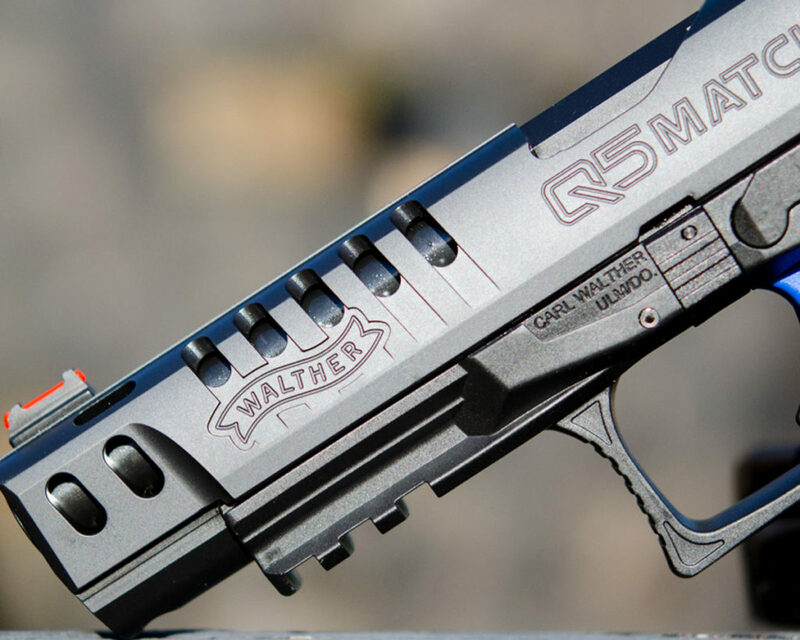 Going back to the definition of ergonomic – the Walther Q5 Match is a gun that I don’t even have to think about while I’m shooting it, which allows me to focus on all the important things that are going on downrange and around me. When the Q5 was introduced, the big question was “is it worth it”. Considering its MSRP of $870, a few hundred more than the 5” PPQ, that is a legitimate question. For me it is. The sights upgrade alone is an easy hundred bucks, and the slide work done to accommodate the optic would cost hundreds on the aftermarket, and probably not be done as well. Those lightening cuts in the slide are not just there to make the gun look badass – which they surely do – but were engineered for just the right weight and balance. Toss in the match grade barrel and I think the gun is priced in the right spot. In my opinion, you would have to spend twice that much before you are even approaching a better match pistol. With the new Q5 Match Steel Frame pistol just released, the question may be what is the purpose now of this gun? Two things: weight and price. The need for the polymer framed Q5 Match isn’t going to change. I don’t see Walther cannibalizing their own market share – I see it as an enhancement. 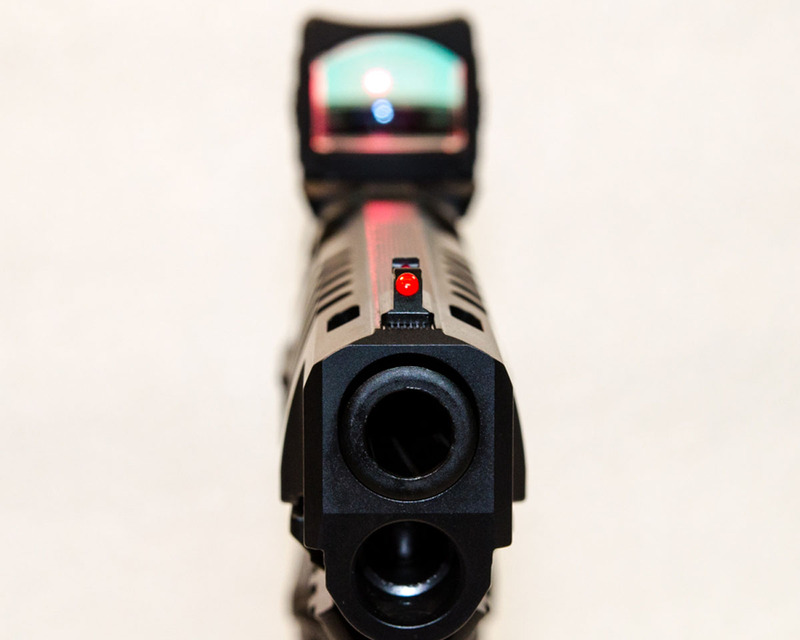 Even without a red-dot installed, the bright fiber optic front sight gives the shooter a quick advantage on the target. Walther opted to mount the rear sight on the removable cover, meaning no co-witness option and no backup. This was necessary in order to accommodate the adjustable sight. 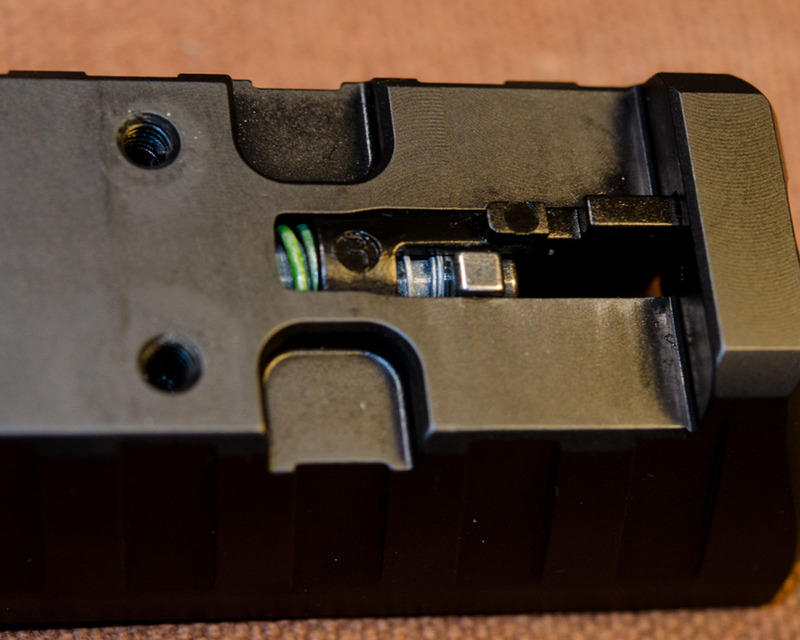 The subtle relief cut opposite the ejection port is another place where Walther combined weight removal and aesthetics. The mounting plate and optic jut out considerably from the gentle taper of the PPQ slide. 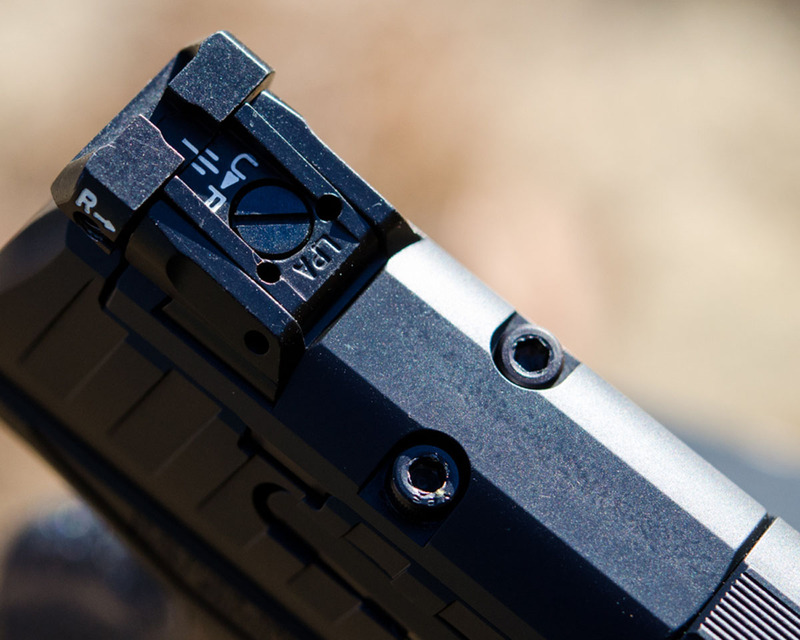 The optic mounting plate will require additional consideration from the holster. This Multi Holsters rig was custom made for the Q5 Match. Standard PPQ holsters may not accommodate the plate.